Designed to remove scratches with Mothers PowerBall Mini MD! Mothers PowerMetal Scratch Removing Polish restores the shine to metals and removes stains and scratches. Designed specifically for use with the Mothers® PowerBall Mini MD®, PowerMetal® Scratch Removing Polish has just the right amount of complex chemistry and compounds to get the job done quickly and easily. Mothers PowerMetal Scratch Removing Polish is made to eliminate imperfections on polished aluminum and stainless steel surfaces. Beyond just cleaning metals, Mothers PowerMetal Scratch Removing Polish actually removes scratches to restore a smooth, uniform appearance. 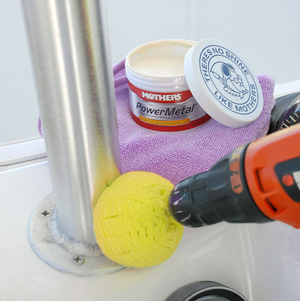 Mothers PowerMetal Scratch Removing Polish should be applied with the Mothers PowerBall Mini MD to maximize its polishing ability. The consistent spinning action of the PowerBall enables PowerMetal Scratch Removing Polish to level scratches more effectively. The PowerBall Mini MD provides easy access to concave areas, like wheels. This combination of products works together to restore aluminum and stainless steel surfaces more efficiently than hand polishing. Save yourself time and effort by polishing your vehicle’s metal parts with Mothers PowerMetal Scratch Removing Polish.